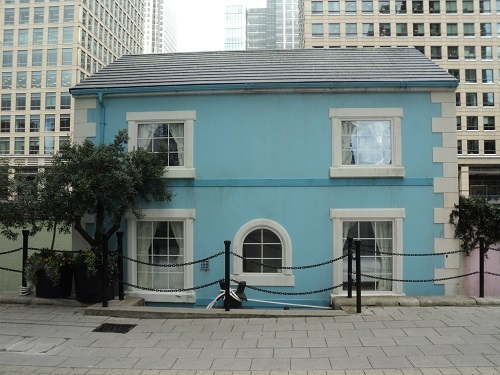 Part of the task of writing a blog like Isle of Dogs Life is to undertake a great deal of research and to read many of the fascinating stories associated with the Isle of Dogs. It is through the stories of people’s experiences that allows you to gather insights about the past. Recently I was made aware of a project that seeks to develop people’s storytelling skills by helping them to get know their community; its history, its achievements and the issues that matter most to people. 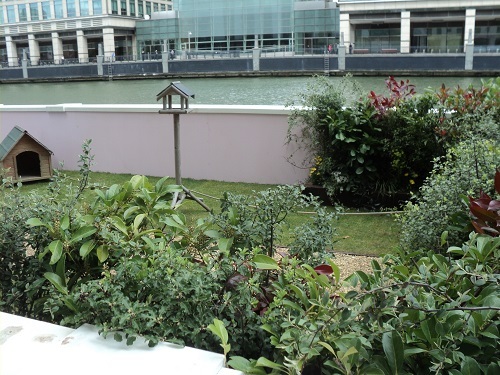 The project has been developed by Queen Mary, University of London as a leadership development program for people who live, work, or study in the E14 postcode of Tower Hamlets. The program was open for everyone regardless of ages, nationalities, cultures and backgrounds. Part of the project was to produce a book of some of the stories the group had gathered. 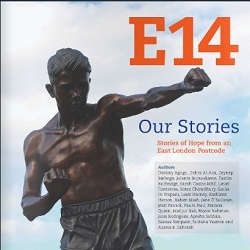 The book is titled E14: Our Stories (Stories of hope from an East London Postcode). The launch of this book celebrating the achievements and local heroes of communities from the E14 postcode of Tower Hamlets will take on Saturday 30th May at George Green’s School from 12-1:30pm. The launch is an opportunity to learn about the project, meet some local heroes and enjoy food and drink from different cultures. There will also be copies of the book available to take away on the day. The scope of the project includes the personal development of the participants but looks at ways to make positive change in the local community. It is remarkable the way that the interest in local history and history in general has grown in recent years. There is many reasons for this, however you usually find in times of rapid changes there is a tendency to look back to make sense of where we are going. Looking into a history of a particular location also tends to give you a sense of perspective, for those who think times on the Island are bad now, may want to read about the Distress of the 1860s or the experiences of those who survived the Blitz. It is also worth remembering that Charles Dickens wrote about his visit to the Isle of Dogs, Joseph Conrad wrote about the docks, more recently Peter Ackroyd and Iain Sinclair have featured the area, the E14 group are following a long tradition of storytellers to want to tell the story of this fascinating piece of East London. 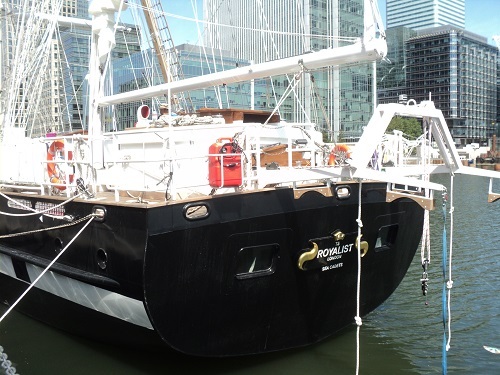 Last September after the Tall Ships regatta, one ship stayed in West India Dock to be given a final send off. 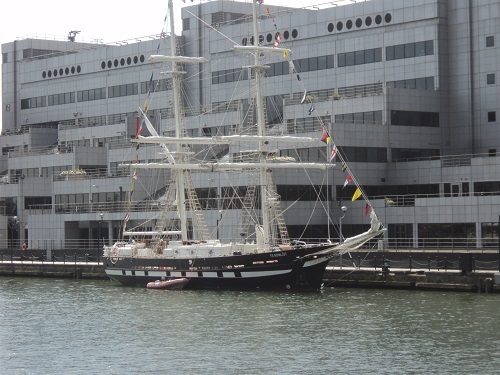 That ship was the TS Royalist when a celebration took place to honour its service for the Sea Cadet organisation. Although it was a celebration , there was a tinge of sadness as the old ship was due to be decommissioned after over 40 years service. In her years of service it is estimated she had taken over 30,000 cadets to sea. The cadets generally join the ship for a week and learn the rudiments of sailing a large ship. 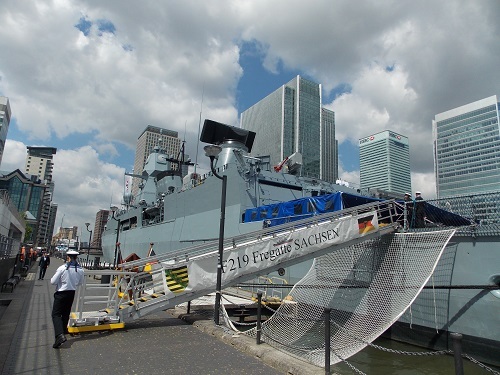 To build a replacement for the ship, the Sea Cadet organisation had to raise nearly 4 million pounds in two years , when the target was reached the organisation awarded the contract to a Spanish shipbuilder but sourced a considerable amount of the equipment from the UK. 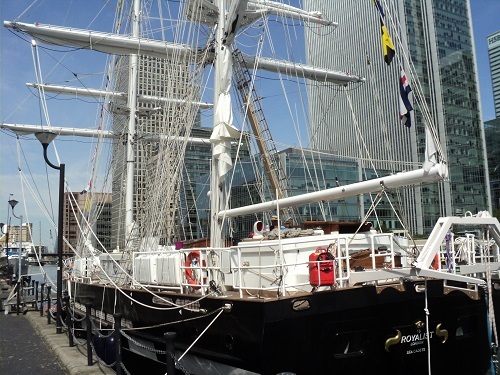 Remarkably the new TS Royalist is now in West India Dock to await its commissioning on Friday, looking on the surface very similar to its predecessor, the ship has been fitted to better suit the modern sailor. Havengore’s most famous moment came in 1965 when, watched live by a worldwide audience of 350 million, she took centre stage as she carried Sir Winston Churchill on his final journey by water along the Thames. 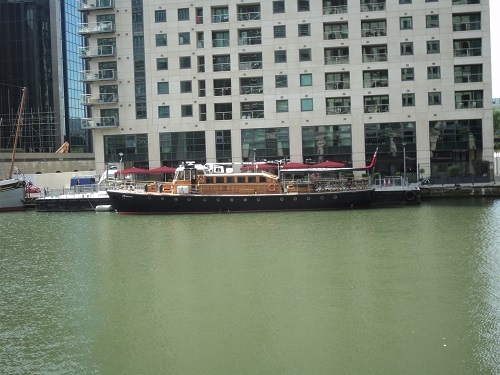 More recently Havengore was selected to carry members of the royal family as part of Queen Elizabeth II’s Diamond Jubilee celebrations in a flotilla of over a thousand vessels during the River Thames pageant on 3rd June 2012. 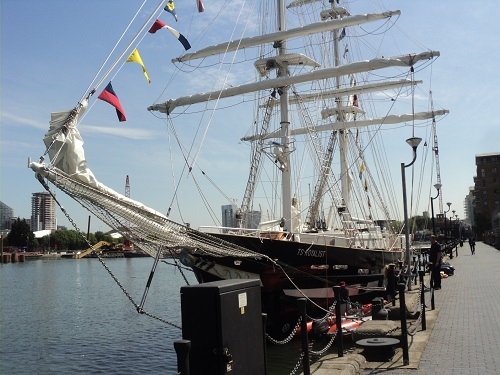 It is not known how long the Havengore or TS Royalist are in dock but they are both well worth a visit. 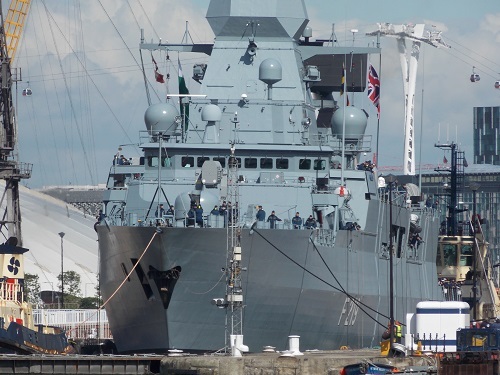 A recent visit by a number of ships of the German Navy is followed up today by another German Navy ship, the frigate Sachsen. 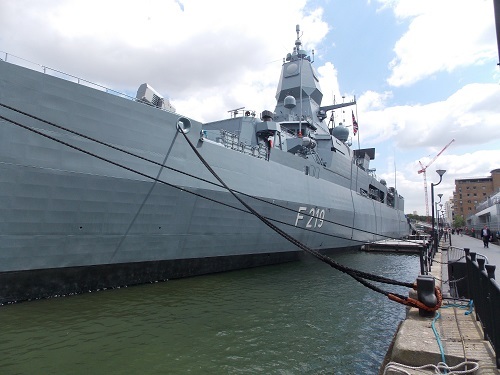 The ship is a Sachsen-class frigate and part of the Germany air defence systems, its state of the art technologies supposedly include the ability to detect stealth aircraft and stealth . These ships are heavily armed for anti-air warfare role with a large number of missile available. 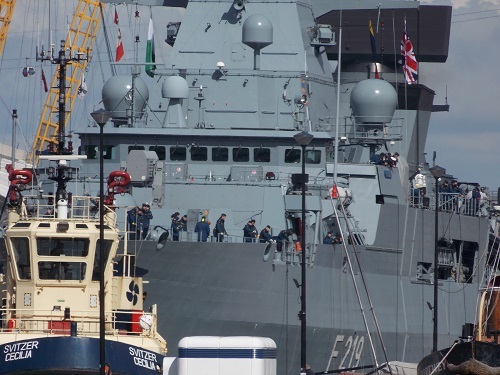 There are also torpedoes for use against submarines.Sachsen is equipped with a flight deck and hangar that can accommodate two Super Lynx or NH90 helicopters. 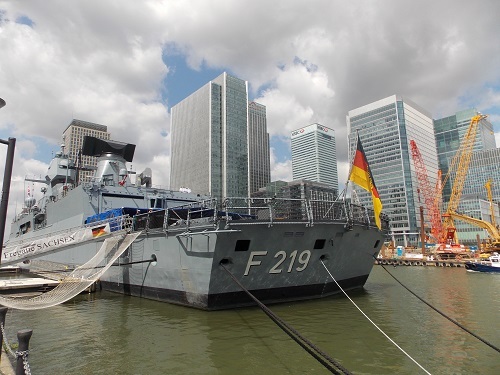 The F219 Sachsen was built at the Blohm + Voss shipyard and launched in 2001 and was commissioned in 2003. 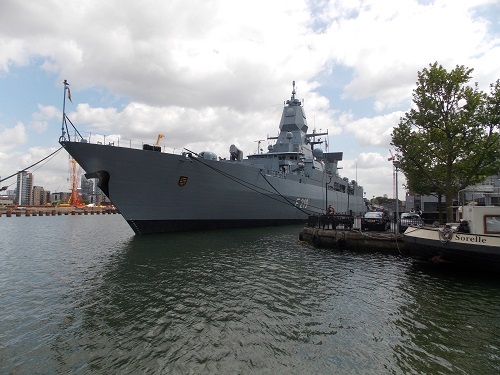 The Sachen has been involved in a number of anti terrorist and anti piracy patrols around the world. 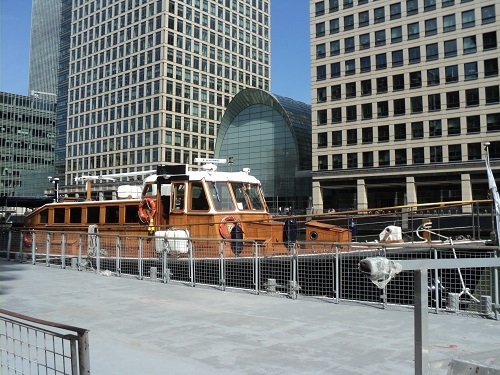 It is not known why the ship is visiting London at this time, but there seems to be a number of functions. It is likely the ship will be leaving dock at the weekend. 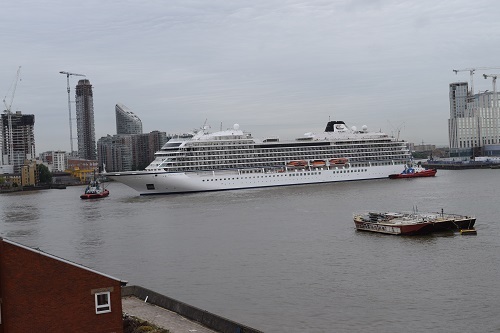 Recently the West India Dock has been home to ships of the German Navy and Super yachts , however today’s visitor is something more unusual. 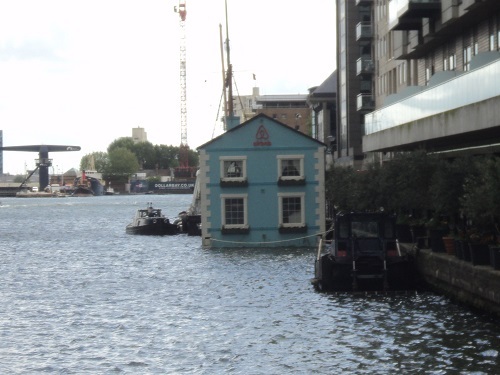 Yesterday the news channels were reporting on a floating house with garden travelling up and down the Thames, in between its travels it has been berthed at West India Dock. 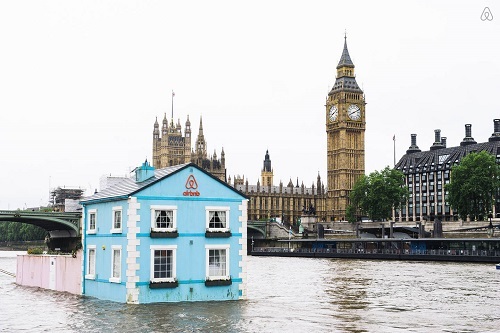 Airbnb, a home sharing company is behind the publicity stunt of floating a house down the river Thames to celebrate new rules on short term lets in London. The full size house and garden was created by designers Nick and Steve Tidball who were determined it should be a real house not a stage set. Therefore it has bedrooms and a bathroom, a book collection, a dog kennel, and private garden. 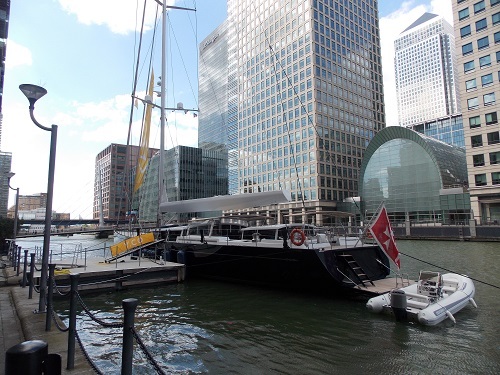 It is not the only publicity stunt that has made its way to West India Dock, in recent years we have had a gigantic inflatable duck and enormous lottery balls. 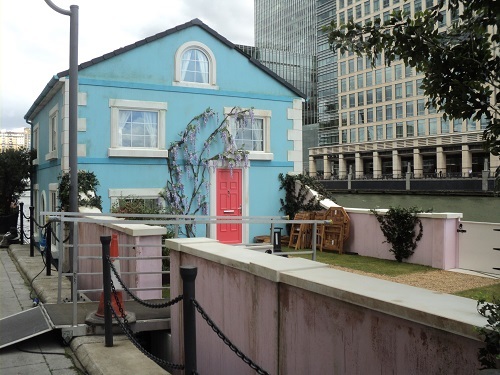 There is a competition run by Airbnb to stay in the house which bring a whole new meaning to houseboat. After the nautical excitement of last week, it is now the time for murder on the Isle of Dogs. 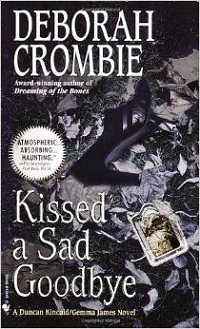 Fortunately it is a fictional crime and a book written by well-known American crime writer Deborah Crombie. Regular readers will know I am always on the look out for books that feature the Isle of Dogs and Kissed a Sad Goodbye features many of the Island landmarks. The book was written in the late 1990’s and captures the considerable changes taking place on the Island at that time. The story begins with George Brent, an Islander walking his dog near to Asda when he finds a young woman’s body in the tall grass of Mudchute Park, Duncan Kincaid and Gemma James, Detectives from Scotland Yard are assigned to the case and quickly begin to realise that this will not be a straightforward case. A number of characters appear on the police’s radar, a mysterious busker who plays in Island Gardens and the Greenwich foot tunnel, the victim’s well to do fiancé; her sister’s ex-husband and her father. What is intriguing about the book is that the author uses the history and character of the Docklands and the Isle of Dogs to provide an atmospheric background to the story. She cleverly intersperses the modern aspects of the story with historical accounts of the evacuation of local children during the bombings of WWII. Another interesting part of the book is how the author has used the research of people like local historian Eve Hostettler to provide small quotes at the start of some of the chapters. The author’s extensive research gives the book a great deal of credibility and manages to tap into the Islands unique history. Deborah Crombie was born in Dallas and bought up in Texas, She then worked in advertising and newspapers. A visit to England led to a life-long passion for Britain, and she later moved to the UK with her first husband living in Edinburgh and Chester. She returning to the US and wrote her first Detective Superintendent Duncan Kincaid/Sergeant Gemma James novel, A Share in Death in 1993. Her subsequent novels have been published with success all over the world. It is quite surprising how many American crime writers write about London and especially about East London, but this is one that focuses almost entirely on the Isle of Dogs which is more unusual. If you come across a copy it is well worth a read and shows that in many ways the Island certainly has a global appeal. In the 9th century, Viking attacks on London were common and the sight of the Longships going around the Isle of Dogs would have provoked terror amongst the local population. There is even evidence that the Longships travelled up the River Lea to go inland to pillage. 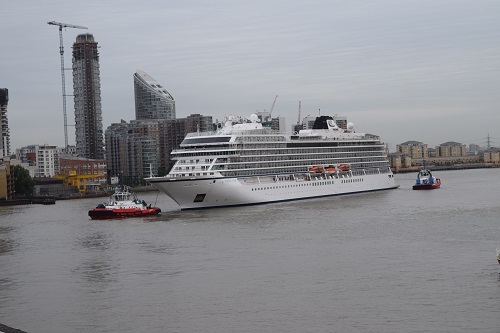 How times have changes, the sight of the enormous liner Viking Star was captured by Eric Pemberton has it made its way for a short stay in Greenwich. 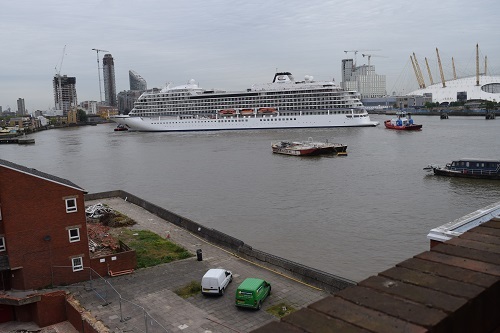 47,800 tonne cruise ship which has 465 cabins and will accommodate 930 passengers is on its maiden voyage only just squeezed through the Thames Barrier and was captured by Eric as it passed the O2 Arena. The ship set sail on April 11th from Istanbul, before traveling through the Mediterranean. After her short visit, the ship will continue back north to be christened in Bergen on May 17th. Not sure what Sweyn Forkbeard or Cnut the Great would have made of the ship, the Snow Grotto and the Craft Beer Library, but it is the latest of a number of interesting recent visitors. 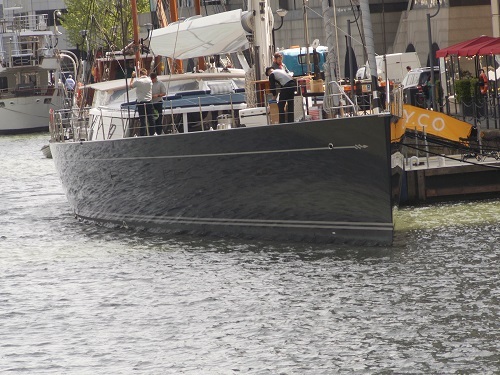 Somewhat overlooked when the German Navy was in West India Dock, a large sleek sailing yacht now takes centre stage. 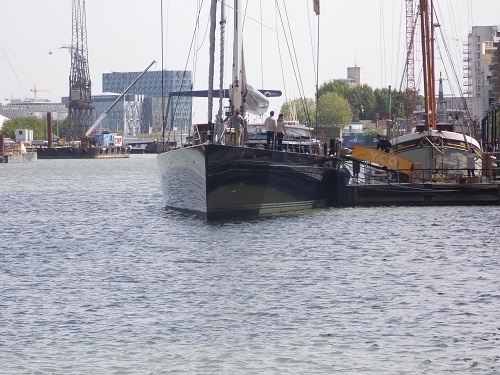 The Cinderella IV is a 39m sailing yacht built by Vitters in 2009, it has a carbon composite hull with a lifting keel. 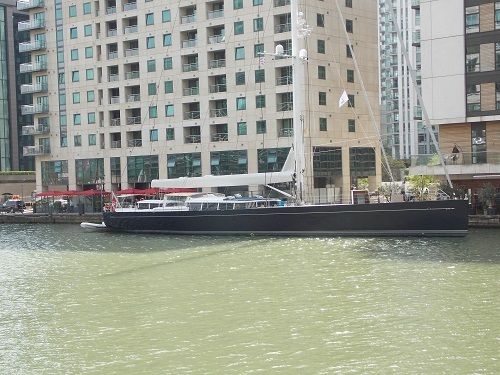 It is in West India Dock to allow potential buyers to see the yacht at close quarters, Y.CO are the company behind the sale. 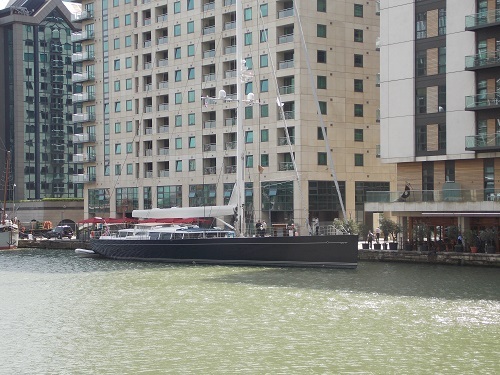 As regular readers of the site know, Super yachts are quite common in West India Dock and this is a nice example of the luxury sailing yachts. Although it has an attractive exterior, no expense has been spared on the interior including a fully panoramic salon. There is accommodation for 8 guests in 4 staterooms. It is always quite surprising how many of these Super yachts are available for charter or for sale, if you want to take this particular Cinderella to the Ball the price is 12.75 Million Euros.